For the Flounder-inspired DIY Sugar Scrub (or these colours could work for a King Triton Sugar Scrub), we went with a peppy coconut-lime scent to go with his peppy personality. 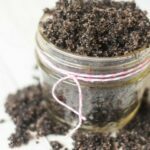 If a child is making and using this sugar scrub, some coconut flavor extract is perfect, while grown-ups can use lime and coconut essential oils. Divide the sugar into three bowls, equally (about 2/3 cup in each bowl). Melt the coconut oil 3 Tablespoons at a time. Stir in 1-2 drops coconut essential oil and 1-2 drops lime essential oil or 1/4 teaspoon coconut flavor extract, and a couple drops each blue and yellow coloring to achieve a teal color. Add to one bowl of sugar to dye teal, combining thoroughly. Repeat, combining 3 Tablespoons coconut oil with 1/4 teaspoon extract or 2-4 drops essential oil and adding to one bowl of sugar for your white layer. Finally, combine 3 Tablespoons coconut oil with 1/4 teaspoon extract or 2-4 drops essential oil, now with yellow coloring and add to the final bowl of undyed sugar. 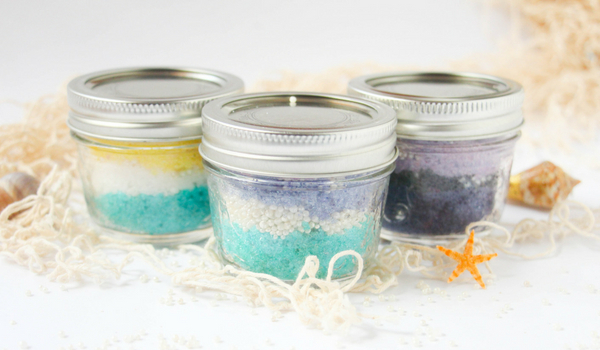 Layer the colored sugar scrubs in your mason jar, ensuring that the white sugar scrub layer is in the middle. 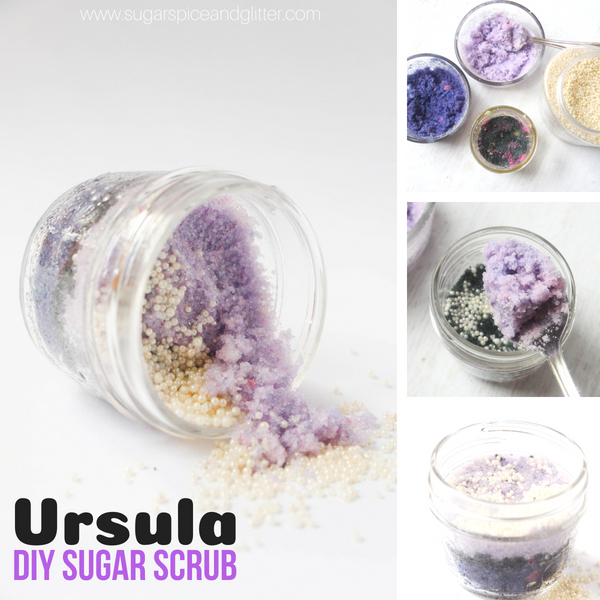 For the Ursula-inspired DIY Sugar Scrub, we wanted something that would calm Ursula down – so we went with a relaxing combination of lavender and rose. 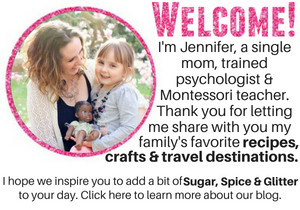 If a child is making and using this sugar scrub, a splash of rose oil and some lavender extract (or even lavender buds) would be perfect – while adults can use a combination of lavender and rose/bergamot essential oils. Place the sugar all in one bowl and have two additional bowls ready. Melt the 1/2 cup coconut oil, stir in 6 drops rose essential oil and 3 drops lavender oil or 1 teaspoon rose water and a couple drops lavender extract, and then add enough red and blue food coloring to achieve a light purple (lavender) color. Leave the first bowl as-is, then dye the second equal (larger amount) of purple sugar scrub a bit darker – almost a grape/eggplant purple. 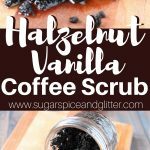 Finally, dye the 2-3 Tablespoon portion of sugar scrub black by adding a combination of different colors – concentrating more with the blue pigment. This just needs to look somewhat black, don’t worry about perfection. 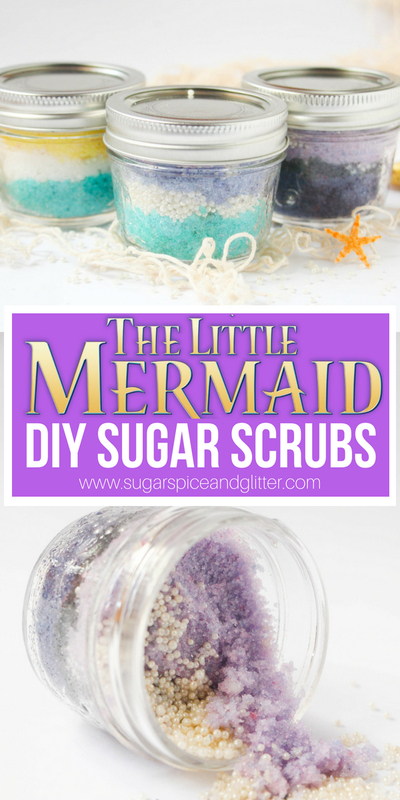 Layer the colored sugar scrubs in your mason jar, separating the colors by adding a Tablespoon of bath pearls: dark purple, bath pearls, black sugar scrub, bath pearls, light purple sugar scrub and then top the final layer of sugar scrub with a Tablespoon of bath pearls. For the Ariel-inspired DIY Sugar Scrub, we went with a tropical orange scent that is happy yet relaxing. If a child is making and using this sugar scrub, use orange flavor extract - adults can use wild orange essential oil. Melt the coconut butter 3 Tablespoons at a time. Stir in 2 drops wild orange essential oil or 1/4 teaspoon orange flavor extact and a couple drops red food coloring to create a pink color. 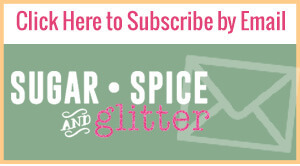 Add to one bowl of sugar to dye pink, combining thoroughly. Repeat, combining 3 Tablespoons coconut oil with 1/4 teaspoon extract or 2 drops essential oil, now with red and blue coloring to achieve a purple color. Add to one bowl of sugar. Finally, combine 3 Tablespoons coconut oil with 1/4 teaspoon extract or 2 drops essential oil, now with blue and yellow coloring to achieve a teal color. Add to the final bowl of undyed sugar. 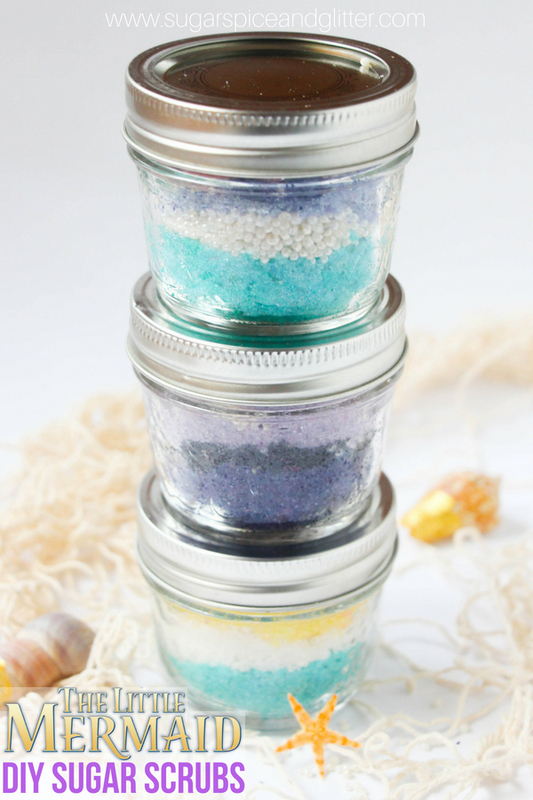 Layer the colored sugar scrubs in your mason jar, separating the colors by adding a Tablespoon of bath pearls. 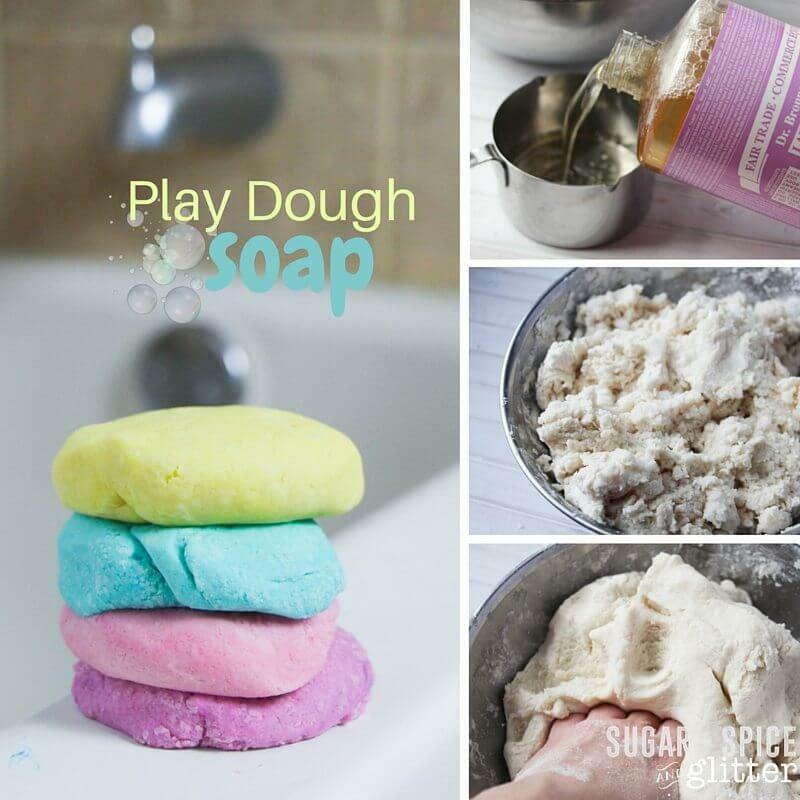 Top the final layer of sugar scrub with a Tablespoon of bath pearls. Melt the coconut butter 3 Tablespoons at a time. Stir in 1-2 drops coconut essential oil and 1-2 drops lime essential oil or 1/4 teaspoon coconut flavor extract, and a couple drops each blue and yellow coloring to achieve a teal color. Add to one bowl of sugar to dye teal, combining thoroughly. For the Ursula-inspired DIY Sugar Scrub, we wanted something that would calm Ursula down - so we went with a relaxing combination of lavender and rose. 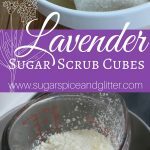 If a child is making and using this sugar scrub, a splash of rose oil and some lavender extract (or even lavender buds) would be perfect - while adults can use a combination of lavender and rose/bergamot essential oils. Leave the first bowl as-is, then dye the second equal (larger amount) of purple sugar scrub a bit darker - almost a grape/eggplant purple. Finally, dye the 2-3 Tablespoon portion of sugar scrub black by adding a combination of different colors - concentrating more with the blue pigment. This just needs to look somewhat black, don't worry about perfection. 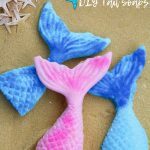 This trio of DIY Little Mermaid-inspired Sugar Scrubs is a fun DIY for little mermaids to make at home to help get them excited about getting clean – or they make a thoughtful gift for a Little Mermaid fan. With three scents to suit different moods (energizing, calming, or happy and relaxing), there’s a scrub here for every occasion. 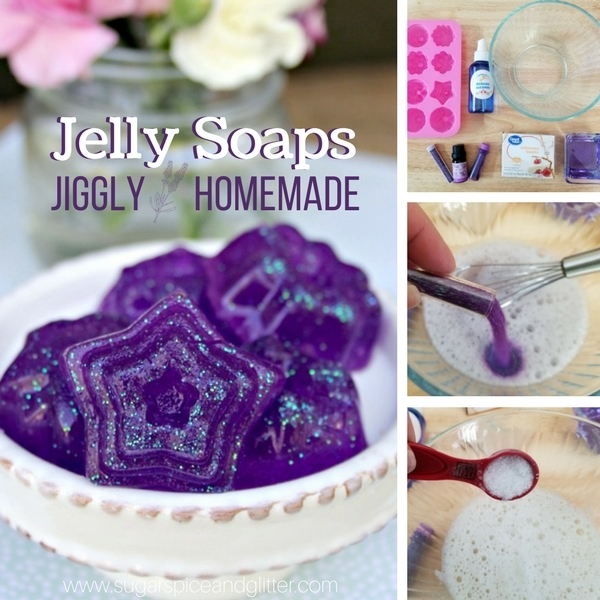 For more DIY Beauty ideas, check out our Homemade Jiggly Jelly Soap or our DIY Play Dough Soap!